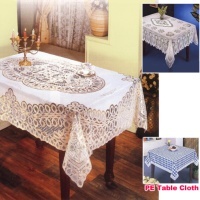 Specializes in manufacturing Vinyl tablecloth, Vinyl Crochet Tablecloth with Golden, Golden Table Mat & Runner, Vinyl Crochet Lace with Fashion Colorline, Vinyl Crochet Lace Tablecloth, Vinyl Embossed Lace Tablecloth, Long Lace & Cabinet Mat with Golden, Decorative Lace Edging, Vinyl Lace Shower Curtain, PE Printed tablecloth with lace Shelf, Place mats, and Doilies Whole Plant Equipments, Design and Moulds. PVC Floor Tile Production Line. PVC Shoe Sole Making Line. PVC Film and Sheets Making Line.